There are a large number of roof sheathing options available in wood-frame construction. Some of these products are more resource efficient than others. depending on the roof application as well as the geographic location of the building. Consider the following points for the appropriate selection of roof sheathing materials. When it comes to roof sheathings. thicker is not necessarily better. The requirements in local building codes represent adequate strength and dura bility, with a factor of safety added on to ensure good performance, provided the material is properly installed. Avoiding the use of thicker sheathings saves money and forest resources. All engineered wood products are not alike. 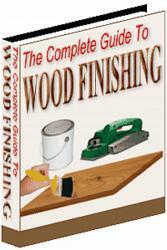 Plywood sheathing is typically manufactured from higher grade species of mature trees. Waferboard and oriented strand board incorporate scrap wood and wood from less desirable. fast-growing tree species. Both types of engineered wood products provide adequate performance, but the latter group of roof sheathing products may be more resource efficient. In many areas, using local materials is more appropriate than importing materials. For example, using rough sawn boards as roof sheathing is preferred in many parts of Canada over engineered wood products. The selection of local materials encourages employment and reduces the use of energy associated with the transport of imported materials. The type of roof covering which is selected often determines the number of roof sheathing options available. 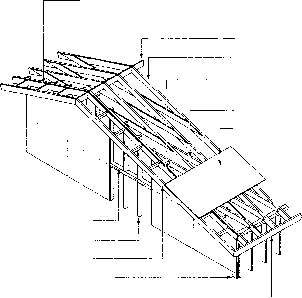 When metal or wood shake roof coverings are used, spaced boards may serve as the roof sheathing, utilizing a fraction of the wood compared to sheet-type roof sheathings. Keep in mind that no matter what type of roof sheathing option is selected, a key consideration is the quality of workmanship employed. the rafters and headers around the opening. 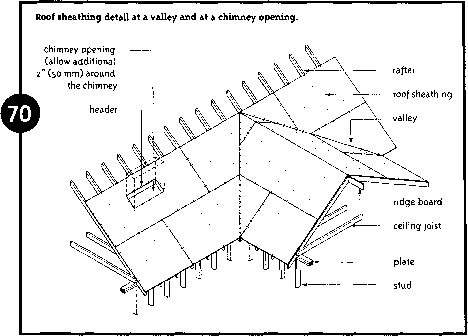 Roof sheathing at valleys and hips should be fitted to give a tight joint and should be securely nailed to the valley or hip rafter (Fig. 70). This will give a solid and smooth base for flashing. Flashing is discussed in detail in the chapters that follow. Refer to this discussion for more information.